HOLIDAY HOURS: Both Libraries will be closed Sunday April 21 for Easter. We need your input about how health and wellness programs can best serve the MetroWest region. All feedback is anonymous, and there are no right or wrong answers! 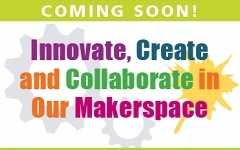 Our new Makerspace will be an interactive creation zone brimming with resources for all ages!